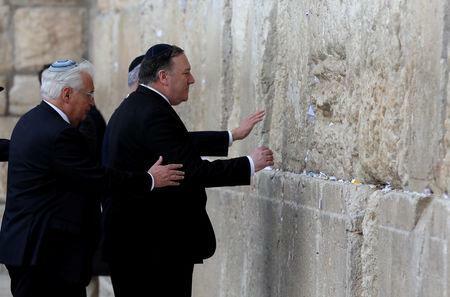 JERUSALEM (Reuters) - U.S. Secretary of State Mike Pompeo accompanied Israel's prime minister on a visit to the Western Wall in Jerusalem's Old City on Thursday in the first such gesture since Washington recognized Jerusalem as Israel's capital, angering Palestinians. Later that year Trump reversed decades of U.S. policy and officially recognized Jerusalem as the Israeli capital, though making clear that he was not prejudging a settlement on where the city's borders should be. 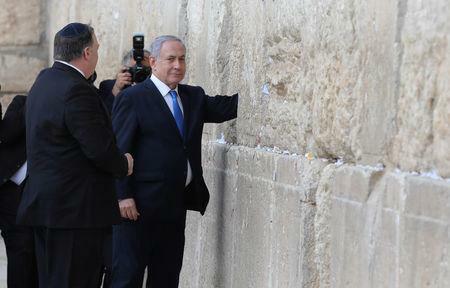 Since that shift, the U.S. ambassador to Israel has paid visits to the Western Wall along with Netanyahu. Pompeo suggested that his own visit as the top U.S. diplomat in Netanyahu's presence was significant. "I think it's symbolic that a senior American official goes there with the prime minister of Israel," he told reporters prior to arriving in the walled Old City. Pompeo, Netanyahu and U.S. Ambassador David Friedman together approached the wall and each leaned against its massive stones with one hand. 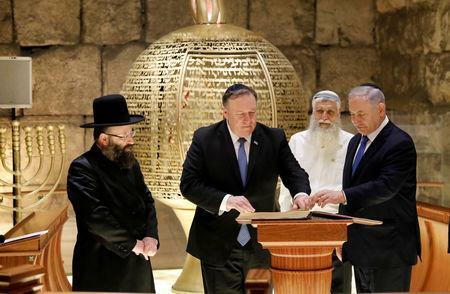 Pompeo then placed a prayer note in between the stones, as is customary. Before going to the wall, he visited the nearby Church of the Holy Sepulchre, believed to be site of Jesus' crucifixion and burial.